Profit vs Loss Ratio is one of the most important tools in strategic investing and is used by mostly every experienced investor. Profit vs Loss Ratio is one of the most important tools in strategic investing and is used by mostly every experienced investor. It allows an investor to limit his/her losses and increase the profits. Given below is the information you will need to understand everything about a profit vs loss ratio and how you can set up a ratio for yourself to help you trade better in the market. A Profit vs Loss ratio is a tool that you use to limit your loss to X% while setting your profits to give you returns amounting to X%. Depending on your ratio, you can be wrong several times and be right only a single time, and you will still make a profit in your trade. The whole point of establishing this ratio is to keep losses as far away as possible as you can still make a profit even when you are wrong in your decisions multiple times in a row. How to set up your ratio? 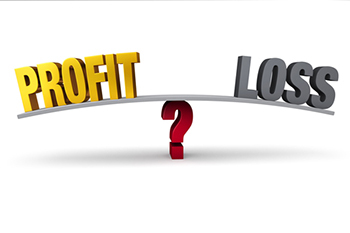 Two factors influence every Profit vs. Loss ratio, target profit percentage per trade and maximum loss percentage per trade. Once you have determined these two elements, you will know your ratio. The best ratio one can identify and is highly recommended by every expert is 3:1 loss to profit ratio. This means that you can be wrong two times in a row and still make a profit from being right the next time. Let's say that you want to cut your losses at 7-8% and you immediately put a stop loss at this percentage. This would mean that your shares will be sold as soon as the price falls below this level. On the upside your shares will be sold if the price goes up to 20-25 %, thus making an effective ratio of 3:1. It goes down 7% (-1,400 Rs), and you sell, leaving you with Rs 18,600 to trade in the future. It too goes down by 7% (-1302), and you sell, leaving you with Rs 17,298 to trade in future. It goes up by 25% (+4,300), and you sell, leaving you with Rs 21,500. Even though you incurred a loss twice in a row, you still made a profit of Rs 4,300 only because you were right the third time. With the effective ratio of 3:1, you have reduced the risk of your loss from one wrong decision to two. The most important thing regarding the ratio is that you have to make great efforts to maintain it if you want to avoid losses in the market. You should put stop loss immediately at every stock you purchase and sell your stock every time the price rise to 20-25%. If maintained in a disciplined manner a Profit vs. Loss order can increase your gains multifold even when you have incurred losses in your previous trades. For a beginner investor, a Profit vs. Loss order should be the primary priority if he/she wants to cut losses while trading.